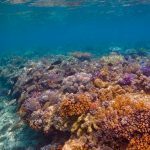 Experience a full-day Great Barrier Reef adventure taking you to selected moorings around Bait Reef – the closest of the outer reef locations. 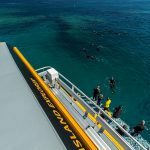 Boarding at 8.30am and departing Abel Point Marina at 9.00am and returning 6.00pm, this full day tour visits two locations within Bait Reef. A minimum of 3.5 hours is spent on location. 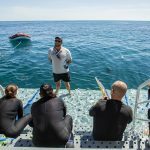 The reef is accessed by a premium brand new custom designed dive vessel, Island Explorer. She has two levels of air conditioned luxury, lounge style seating, a partially shaded deck and fresh water shower on-board. There is a full beam swim platform which makes entering and exiting the water a comfortable and easy experience. Smaller groups to ensure a more personalised and quality experience. Top of the line vessel. ***Please be aware if it ‘s too windy to head out to the Outer Reef, they will change the trip to snorkel around the Inner Islands.